In times when brands are judged less by their offerings and more by the values they stand for, the importance of brand safety is much greater than you could possibly imagine. In the not-to-distant past, we used to love certain brands because of what they projected. If you fancied yourself the rugged type, you’d smoke Marlborough’s. If you were too cool for school, you’d pick up a pair of Ray-Ban’s. If you wanted your date to see your sophisticated side, you’d order a Perrier, and if you wanted your friends to view you as more of a foodie, then you’d skip the junk-food joints and take them out to Shake Shack. But something’s changed over the past few years, as today’s millennial consumers care less about what the brand projects, and more about what the brand stands for. Take the recent Nike campaign with Colin Kaepernick. The brand’s choice to back the courageous/controversial figure resulted in a huge increase in support (and sales) from so-called liberals. On the flip side, many conservatives were infuriated and called for boycotts, while some extremists went as far as burning Nike shoes. This shouldn’t surprise anyone as recent data published by Forrester showed 70% percent of millennials actively consider company values when making a purchase. In fact, I experienced this phenomenon first-hand earlier this year. I was finishing up a business lunch, when the person I was meeting with paused our conversation to order an Uber. As she launched the app, she suddenly hesitated, paused and then said, “You know what, I’ll actually order a Lyft.” I gazed at her with a puzzled look and said, “Wait… Why did you just change your mind?” Without hesitation, she replied, “I don’t know, I just like Lyft more.” Now, I’d maintain that there’s not much of a difference between Lyft an Uber in terms of experience, availability or price. But when I dug deeper I realized, that she simply preferred the Lyft brand over the Uber brand. Now, from a millennial perspective – I get it. Uber has got a lot of bad press for an allegedly problematic workplace culture and sexual harassment. This has naturally aligned the brand with values that millennials want to distance themselves from, especially in the #MeToo era. Lyft on the other hand, is a pink and positive brand which has successfully aligned itself with millennial values like diversity, entrepreneurship and self-actualization. This explains how Lyft recently grew its market share from 20% to 25% in just 18 months. 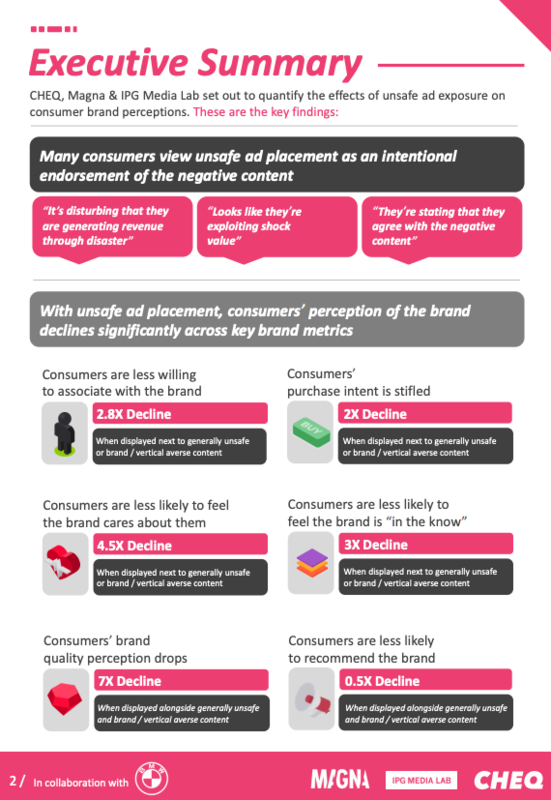 In a recent study by CHEQ, IPG Media Labs, Magna and BMW, it was revealed that consumers view brand-safety incidents (the placement of an ad alongside negative, violent, graphic or offensive content) as an intentional endorsement by the brand. So, if your ad appears in an article containing racist themes, consumers assume your brand is endorsing the views in the article. This is an astonishing finding, but actually not surprising if you consider the fact that most people don’t understand how media is bought. Some research participants were quoted saying that “it looks like they’re (the brand) exploiting shock value” and “it’s disturbing that they’re generating revenue through disaster.” The assumed intentionality seemed to really get under the consumers’ skin, resulting in significant damage to their perceptions of the brand. For example, the study showed a 280% drop in the consumers’ willingness to associate with the brand whose ads were displayed alongside “unsafe” content. It was that easy to get people to completely disengage from a brand, simply by having the ads poorly placed. Considering how much time, effort and resources brands invest in building up their rapport, it’s startling to see just how easily it can all go to waste. But that wasn’t the only brand metric to sustain heavy damage. The study showed a 700% drop in the brand’s quality perception, a 200% drop in purchase intent and a 50% drop in the consumers’ willingness to recommend the brand. Today’s brand-safety enforcement efforts aren’t enough, as leading brands repeatedly end up alongside extremely nasty content. If you’re spending big online, then your brand is sustaining heavy damage as a result of bad ad placement. Brands should be asking themselves, “does my current solution provide me with complete coverage”? “Are we applying the most advanced tech”? “Does the solution prevent, or does it just detect after the fact”? Brands cannot afford to get these questions wrong, especially in an age of ideological and unforgiving consumers. 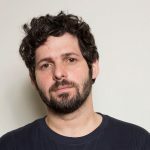 Daniel Avital is Chief Strategy Officer of cybersecurity company CHEQ, empowering Autonomous Brand Safety with AI-driven technology. Daniel has an agency background and joined CHEQ after serving as a lead strategist at Grey group.